I don’t make many wildlife pho­tographs, but this one I couldn’t pass up. I took this pho­to while work­ing at the Beaver­hill Bird Obser­va­tory near Tofield. 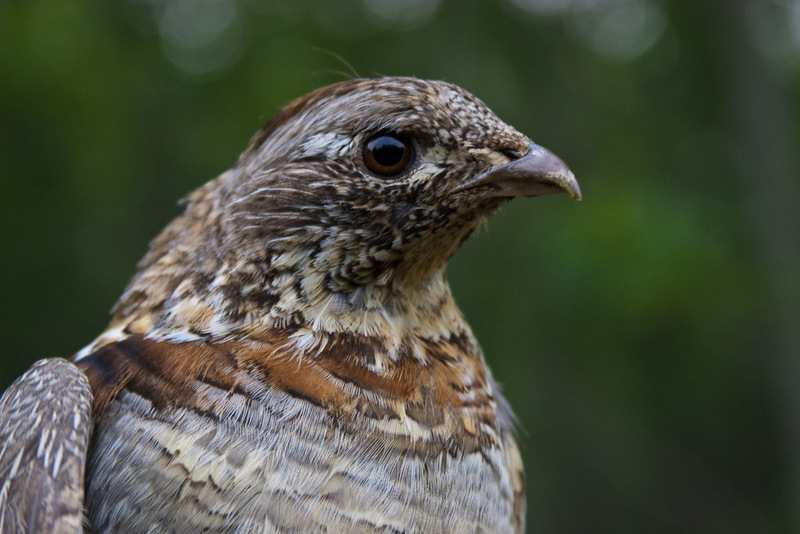 I must admit that while this is a wild Ruffed Grouse, he wasn’t par­tic­u­larly free at the time of this pho­to. One of the things that I love about band­ing birds is get­ting to see them so close. At this range, even the drabbest spar­rows (and grouse) are full of sub­tle detail, pat­tern and colour. I like how this pho­to cap­tures some of those close-up details that are nor­mally missed at reg­u­lar grouse-view­ing dis­tances. It was a treat to catch this bird, and I’m glad to have this pho­to as a reminder.